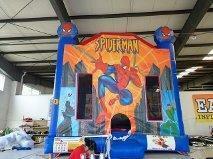 Join the Web-Slinger in our Spider-Man 15' x15' Jumper and finish off the Green Goblin and Dr. Octopus once and for all. With graphics direct from Marvel Comics, Peter Parker's alter ego will keep the neighbors thinking you have a gigantic superhero protecting your backyard!!! !